Philadelphia Eagles head coach Doug Pederson looks on during the second quarter against the Pittsburgh Steelers at Lincoln Financial Field. From an official standpoint, training camp is over, though as our own Jimmy Kempski pointed out earlier this week, that effectively only means media will no longer be able to watch the practices between now and the opening of the regular season. Sort of misleading to make a big fuss out of this part of the preseason process being "over" when practices continue at a fairly rapid pace. But since you won't be getting breathless updates from practices the rest of the way in, it's as good a time as any to reflect on what transpired so far in August, and where it leaves the Eagles heading into their rematch with the Patriots on Thursday night. First, a look at one of the men who helped Doug Pederson travel on the path that made him a Super Bowl winning coach. Did the Andy Reid / Eagles split work out for Andy Reid? Now that the Eagles have a Lombardi Trophy in their cabinet, it's a little easier to look back fondly on the Reid years as a strong and enjoyable period of football, even if it ultimately ended without the ultimate prize. Rose-colored glasses are in heavier supply once you climb the summit. As for Reid, well, he's continued to have a lot of the same issues in Kansas City that doomed him here. Reid left Philly with a reputation as a choker despite a 10-9 playoff record. In Kansas City, his postseason record is 1-4. Two of those losses are among the worst collapses in NFL history. At this point, Reid’s volume of playoff buffoonery is so rich that he may be the only coach who could win a Super Bowl and still be known as a choker in the playoffs. Meanwhile, back in Philly, the Super Bowl LII victory proves that Reid won’t be missed, although that wasn’t obvious for quite some time. The organization required a deep clean after three seasons of Chip Kelly, who replaced Reid to much fanfare but quickly soured on everyone. After his ouster, it would have been fair to ask whether the Eagles made a mistake not riding with Reid through a tough stretch. Perhaps members of the organization were thinking the same thing given that they turned to a Reid disciple to clean up the Kelly mess. Doug Pederson first played in Philadelphia in 1999 under Reid, who started him over then-rookie Donovan McNabb (fans tried to pelt Pederson with beer and batteries). 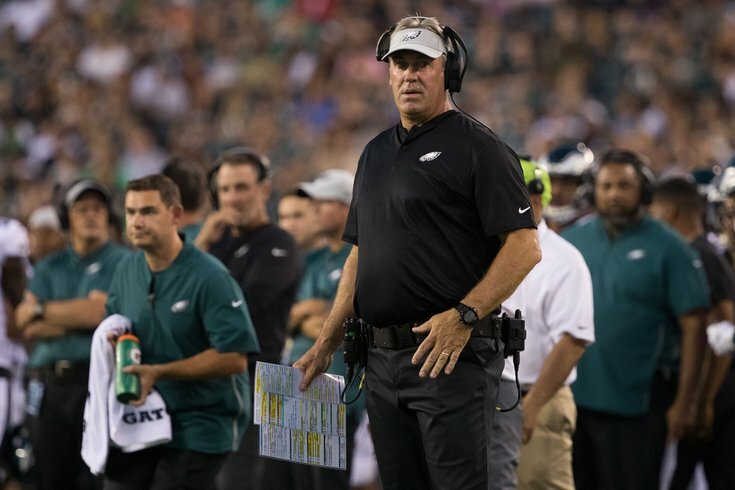 Ten years later, Reid hired Pederson away from a Louisiana high school to work as Philadelphia’s offensive quality-control coach—the coaching version of an internship. After a promotion to quarterbacks coach, Reid hired Pederson to be the offensive coordinator in Kansas City, where, according to The Athletic, Pederson heard the term “RPO” for the first time. Pederson’s ascension to a Super Bowl in his second season is an endorsement of Reid’s coaching tree, which also includes Ravens coach John Harbaugh … but it also highlights Reid’s playoff impotence. BGN's fearless leader has a few thoughts on Carson Wentz, Donnel Pumphrey (unlikely to make the team), defensive line depth, and a whole lot more as we edge closer to the regular season, and his full thoughts are worth checking out. Let's hone in on Wentz, whose status will be a subject a debate right up until he hits the field for real. This belief doesn’t just stem from blind faith. It comes from seeing how healthy and awesome he’s looked while participating in practice. I know the Eagles’ decision to back him off from 11-on-11 has spooked some people, but I just didn’t see the need for him to be risking further injury in those drills. It sounds like Wentz might return to 11-on-11 heading into the third preseason game. If that’s the case, that’ll give him more than two weeks of practice in advance of Week 1. I think that’s enough time. If somehow it’s not, and Nick Foles starts Week 1, Wentz would then have 10 more days before the Eagles play the Buccaneers in Week 2. I’d have to think he’ll be starting by then at the very latest. The Eagles’ actions show Wentz will be starting much closer to Week 1 than Week 7. If Wentz was going to miss several games, they likely would’ve put him on the active/Physically Unable to Perform (PUP) to start camp. But they didn’t. Johnson certainly isn't the only Eagles player unafraid to speak his mind — on a TV somewhere in Philadelphia, Jason Kelce's parade speech continues to play — but he's one of the most outspoken members of the team for sure. Not many people take shots at the Patriots' machine and come out on the winning end of it. But let Johnson and his teammates tell the story, and they'll tell you there's logic and motivation behind every word he says. And sometimes a quote taken out of context can provide bulletin-board material for an opponent. Johnson’s comments, on the other hand, are almost impossible to get lost in translation. And that is often by design. He said he studied the way McGregor verbally disrespected Jose Aldo, the undefeated UFC lightweight champion, before they met. McGregor had won the mental battle, per Johnson, because he had talked himself into believing in his superiority. And when they finally did fight, Aldo was knocked out in 13 seconds. Grades are ultimately in the eye of the beholder, especially because we grade players at different positions and skill levels differently from their counterparts. Quarterbacks are generally held to the highest standard, which comes with the territory of playing the most important position in the sport. So Eliot's view on Wentz's camp reps is fairly encouraging, even if it sounds as though the third-year man needs more reps.
An entire book could be written on what we have seen form Wentz so far in training camp. Some days it looks like a sure thing he is going to play in Week 1. Other days the lack of reps he is taking certainly makes you question when he will actually return. One thing, however, is clear -- Wentz looks fully recovered from the torn ACL he suffered last season. His mechanics are still strong, his arm strength is still there and he can still move around like he used to be able to. Whether that leads to him playing in Week 1 remains to be seen. The good news is in the long term it appears Wentz will be the same player when he does eventually return. Wentz was not that sharp during training camp when you strictly look at his play. He showed some signs of rust and made some uncharacteristically bad decisions with the ball. Last year Wentz was 227 of 330 during training camp, throwing 31 touchdowns and five interceptions. Although those numbers included a few extra practices than the ones above, there is no denying Wentz was much sharper last year than he was this training camp. There's still plenty of preseason action left for players to assert themselves, in addition to time for injuries to take place and make the roster crunch a little less crowded. But once the Eagles finish their second preseason game in New England on Thursday night, we'll be even closer to knowing what the final 53 looks like. Here's Bo on the running back spot, which still seems to have a decent amount of uncertainty beyond the three guys (Jay Ajayi, Darren Sproles, Corey Clement) who appear to be locked in. The pre-camp iteration of this list tabbed Josh Adams as the fourth running back on spec and camp played out in the undrafted rookie’s favor until he suffered a “lower body injury” a couple days ago. With Ajayi set to hit the market this offseason and Sproles entering his final season, the Eagles have little in the way of running back depth behind Clement after this season. If Adams returns to the field and plays again this preseason, he may very well win the job. For now, we’ll guess he’s an IR stash and give the last spot to Smallwood, who can at least pretend to do everything a running back is asked to do. He can also play special teams. It's anyone's guess when we're going to see the wide receiver group at full strength, as Alshon Jeffery's lack of availability continues to hang over Philadelphia. With the top dog on the sidelines and issues keeping the likes of Nelson Agholor and Mack Hollins out of the short-term picture, there's an opportunity for guys further down the depth chart to show and prove. Shelton Gibson impressed in the preseason opener, and will have another shot to do so against the Patriots on Thursday. He’s come a long way since last summer. Shelton Gibson is totally different than the rookie who was, he even admits it, a bit overwhelmed by the NFL and everything that went with it. Gibson’s 63-yard touchdown catch from Sudfeld last week was an example of what he can do – he’s got the speed to run past defenders, he’s good with the ball in his hands and he can find the end zone. He just needs to have confidence in his hands and he’s far more advanced this year than last. A double dose of BLG today, as the man behind BGN reports Darby's contract status could lead to Philadelphia's front office making a deal. But despite reporting this possibility being on the table, Gowton doesn't sound convinced it will happen in the midst of a title defense. If Darby does get moved, the Eagles would be making the trade in part because they feel very good about what they have in their young secondary. Returning starter Jalen Mills has arguably been one of the best players in camp this year. 2017 second-round pick Sidney Jones hasn’t dominated but he’s shown potential. 2018 fourth-round pick Avonte Maddox has recently been receiving first team nickel corner reps in practice. Despite some ups and downs, Rasul Douglas has some NFL experience under his belt and has drawn praise from the coaching staff. De’Vante Bausby has shown the makings of being a rosterable player and D.J. Killings is on the bubble as well. Undrafted rookie free agent Chandon Sullivan could wind up on the practice squad. The recent Maddox development is especially interesting. If the rookie ends up starting in the slot, where does that leaves Jones? He’d be the fourth cornerback in line for playing time with Darby and Mills starting on the outside. Trading Darby would allow Jones to take over on the outside with Maddox staying in the slot. If I were a betting man, I'd lean toward Darby staying. Opportunities to repeat as Super Bowl champions don't come around often, and the Eagles would be best served having as deep a secondary as they can manage.